If your company is bringing a new product or service to market, potential investors are going to want to know you have secure patents in place. Be prepared to offer secure files on both your utility and design patents. If you have not applied for/been granted patents, your investors are going to want to know how you plan to protect their investment. Investors are going to want hard data on any marketing research and market validation your company has conducted. A database of users made up of friends and family is not going to suffice. Real dollars demand real customers; you better be prepared to show traction numbers and not just social media hot air. In combination with your product/market fit information, investors are going to want you to provide data on your cost of acquisition numbers for new customers. While getting 'crunched' in TechCrunch is good for a short-term increase in users, those numbers will not last. You're going to need to provide hard data on how you plan to acquire new customers and exactly how much you think those acquisitions are going to cost. Having that data readily accessible will make for a much smoother due diligence process. Knowing the strengths (and weaknesses) of your competition is almost as important as understanding your own product. Be prepared to share files with investors regarding your competitor's products and services. Forewarned is definitely forearmed when it comes to competition analysis. If you've ever watched the television show Shark Tank, you understand that valuations can be a huge stumbling block for investors. If you don't want investors thinking you pulled your valuation numbers out of a hat, be prepared to share documents detailing why you think your proposed value is accurate. These are just some of the files potential investors are going to want to have access to as they investigate your company. 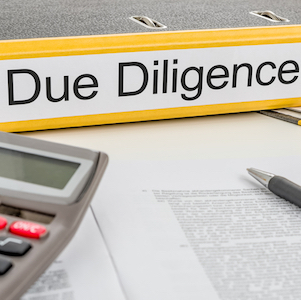 Utilizing the services of a secure data room for your due diligence file sharing can not only potentially speed up the process, but can act as an indicator to investors that you value their time and potential mentorship. Is your startup ready to have investors peek under the hood?